Many of the lakes in Thy lies on sandy ground and have very clear water. The water is poor in nutients, oligotrophic, and the lakes have a special vegetation of water plants which is rare in Denmark. Unfortunally many of these lakes are used for bathing which has a negative effect on the quality of the water. The lake in the picture is called Per Madses Kær, and it is clearly seen that a lot of waterplants are washed up on the shore. The plants are Isoetes echinospora which is a very rare species in Denmark. It is on the danish Red List and has now only a few sites back in Denmark, allmost all in Thy. 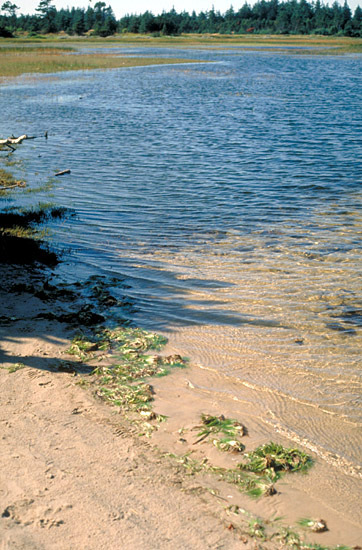 During bathing the vegetation is trampled on and this action releases the nutrients from the plants to the water, which can give rise to algal blooming that makes the water cloudy. If the water gets too cloudy the Isoetes and other bottom plants get too little sunlight and will disappear. Oligotrophic lakes are also very vulnerable to pollution and leaching of nutrients from the surrounding agricultural land. Denmark has only a few oligotrophic lakes back and most of them lies on the sandy soils in Northern, Mid- and Western Jutland. Back to Danish Nature and Vegetation.